Pilate gave the Jews a choice between Jesus and Barabbas. But did you know that Barabbas' first name was also Jesus? This detail isn't mentioned in the King James version, but is in the New Revised Standard Version. While it's an interesting coincidence that Barabbas's first name was Jesus, wait till you hear the rest. First, here's the entire story, as written in the New Revised Standard Version. Matthew 27:11-26 (New Revised Standard) Now Jesus stood before the governor; and the governor asked him, Are you the King of the Jews? Jesus said, You say so. But when he was accused by the chief priests and elders, he did not answer. Then Pilate said to him, Do you not hear how many accusations they make against you? But he gave him no answer, not even to a single charge, so that the governor was greatly amazed. Now at the festival the governor was accustomed to release a prisoner for the crowd, anyone whom they wanted. At that time they had a notorious prisoner, called Jesus Barabbas. So after they had gathered, Pilate said to them, Whom do you want me to release for you, Jesus Barabbas or Jesus who is called the Messiah? For he realized that it was out of jealousy that they had handed him over. While he was sitting on the judgment seat, his wife sent word to him, Have nothing to do with that innocent man, for today I have suffered a great deal because of a dream about him. 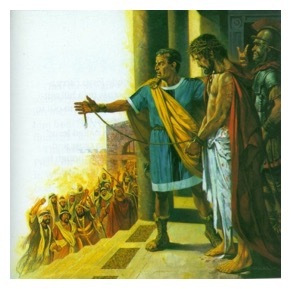 Now the chief priests and the elders persuaded the crowds to ask for Barabbas and to have Jesus killed. The governor again said to them, Which of the two do you want me to release for you? And they said, Barabbas. Pilate said to them, Then what should I do with Jesus who is called the Messiah? All of them said, Let him be crucified! Then he asked, Why, what evil has he done? But they shouted all the more, Let him be crucified! So when Pilate saw that he could do nothing, but rather that a riot was beginning, he took some water and washed his hands before the crowd, saying, I am innocent of this man's blood; see to it yourselves. Then the people as a whole answered, His blood be on us and on our children! So he released Barabbas for them; and after flogging Jesus, he handed him over to be crucified. It would seem then, that by this coincidence, their choice between God and the devil was being reflected back at them in a magnified way. Note: These older, Disqus-based comments are now read-only. My current thoughts about the bible, the world, and our purpose for being here. Who was lying, the serpent or God? "I have begotten a strange son, diverse from and unlike man, and resembling..."
Lot’s wife may not have been turned into a pillar of salt, she may have vanished. Was a biological weapon used against Egypt? This astonishing story is packed with perhaps more clues and mysteries than any other in the bible. This mysterious machine allowed Moses to meet with God face to face. New insight on this curious event. What was the actual purpose of this remarkable event? An analysis of the two shortest and most controversial parables Jesus ever spoke. There is a little-known but very intriguing coincidence in this story. Or was it a coincidence? What do the words Angel, Israel, Raphael, Gabriel, Michael have in common? The surprising origin of this seemingly senseless ritual. Can we link this phenemena all the way back to Cain and Abel? Scripture reveals not necessarily that Satan hated men but that his job was to test their faith. The real reason this town was destroyed. The origin of this familiar term is not very obvious. Why did the "LORD" intervene at Babel? Why did this moving 'star' appear? Who was this parable for? A cosmic secret revealed. You heard it here first. Stuff about me and my family.